Berlin is home to some of the top talents and innovators working with scent - from best-selling perfumes to ground-breaking art projects. With so many noses and industry veterans, we've asked journalist Susan Stone to take us behind the scenes to get to know a few notable players. Susan has lined up a special afternoon of experiences, from scent education and in-depth look at a re-birthed brand that was big in the 20s, to a smelling session with a renowned perfumer, and ending with scented cocktails from a celebrated mixologist. Cost Includes transport, tasting & entry fees, and all associated costs. Nota bene: Excursion booking requires a minimum of 8 persons and we have capacity for up to 12 persons. If the 8 person minimum is not reached, all participants will be fully refunded. The search for a scent sniffed on a stranger at the Philharmonic lead Stefanie Hanssen to create her own perfumery, which she named for her grandmother. Working harmoniously together with traditional West Berlin fragrance maker Harry Lehmann, the shop sells classics like the violet scent worn by Marlene Dietrich, and other vintage-inspired perfumes. But Hanssen also works with Grasse perfumers to create modern homages, The newest chapter for Frau Tonis is collaborations with fresh talents in the creative field - including a food artist and floral designers. 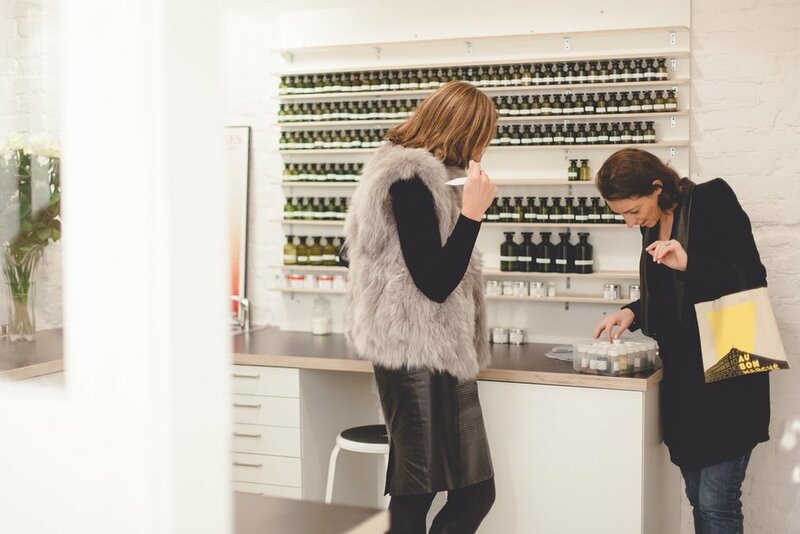 We meet Sarah Phumdorkmai and Gwen Schlüter who invite us to sniff some of the perfumery’s many fragrances, get an overview of its artistic collaborations, and receive a goodie bag to take home. Berlin perfume brand J.F. Schwarzlose has an historic pedigree. The brand was founded in 1856, and folded in 1976, but was resuscitated as a niche line in 2012 by Lutz Herrmann and Tamas Tagscherer. At the peak of its popularity in the 1920’s, the JFS perfume IA-33, named for Berlin’s license plate numbers, was the scent for the modern, on-the-go women. IA-33 bears some resemblance to the iconic chypre Chanel No5, but replaces its jasmine with linden blossom, a Berliner touch. During our visit to JFS, we will see original packaging, learn about the perfume business in Berlin in the 1920’s, see the brand’s artistic take on fragrance advertising, which takes the form of a short fashion film, and get a smelling tour showing how the new JFS reinterpreted classic Schwarzlose fragrances from the brand’s archive. French-trained perfumer Marie Le Febvre has her own line of 6 fragrances, and a series of candles. She also creates bespoke perfumes for private clients as well as fragrances for brands and companies. We’ll meet her at her atelier & gallery space, which she runs with her husband. The tour will end with a special treat — a perfumed cocktail based on one of Marie’ Le Febvre's Urban Scents fragrances. The cocktail is designed by mixologist Arnd Henning Heissen of the Fragrances Bar at the Ritz Carlton, and is made with a special Botanical Fusion perfumed essences. Both Henning Heissen and Perfumer Valeriya Fridman of Botanical Fusion will be on site to discuss the project, and toast the close of the event. A non-alcoholic version of the cocktail will also be available. Susan Stone has been writing about perfume and fragrance innovation for more than a decade. Her print, digital, and audio stories on the subject have appeared in WWD, Monocle24, Deutsche Welle, NPR, and more. She is currently working on a book project focused on scent and creativity. V Berlin is the concierge desk of Valise and offers custom-tailored excursions. We’ll take you to the hard to find insider places that tourists miss and explain their significance in the developing cultural landscape of the German hauptstadt: from art, design, architecture, fashion, gastronomy, the artisanal high street, and Berlin's infamous nightlife. The discerning Berlin vistor, turns to V Berlin.